Plus Ultra! The heroes of Class 1-A are coming to the big screen this September in their first feature film. 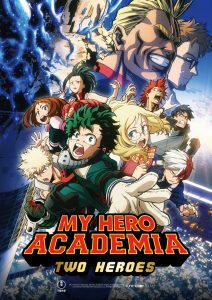 My Hero Academia: Two Heroes will screen at select theatres in Canada and the US across five days in both Japanese with English subtitles and in English. The announcement came earlier today at San Diego Comic Con when English voice actors Justin Briner and Christopher Sabat in an interview with IGN. Briner and Sabat lend their voices in the English dub of My Hero Academia which is licensed by FUNimation. The English dub will screen on the September 25th, 27th, and 29th; the Japanese with English subtitles on September 26th and October 2nd. Izuku Midoriya, alias Deku, a young hero in training, receives an invite to attend a Quirk expo with his idol All Might. At the event, Deku encounters Melissa, a girl who had a similar Quirkless upbringing. The fun doesn’t last as a group of villains override the complex’s security system, putting their evil plan in action. Can the heroes help stop these villains and save the day?